The people were friendly and wonderful and the food fantastic. Such a beautiful gallery of a beautiful place. We were there is May 2014 and really appreciate looking at this photos again. Well captured!!! I like the whole collection V!!! Terrific gallery! My trip in 2014, ready to go back. Could only get to three of the 'Cinque'. V! 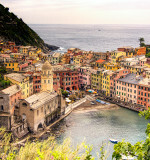 beautiful gallery of this part of Italy, many great shots ! Toscana e Liguria, una scelta perfetta per un assaggio d'Italia. Arte e paesaggi mozzafiato. You captured the essence of those places! Well done! this gallery is getting better and better.V. Superb and colorful images of Tuscany ! V.
I have enjoyed going through this colorful gallery, filled with gorgeous captures of beautiful places. V.
Love this gallery Bart. I've been to these places, you captured the essence if Italy beautifully! BV!! These are fabulous! Do you sell them?